Impact of a change in interest rates on bond prices. The results of a change in prevailing interest rates on bond prices. Generally speaking, when interest rates increase, bond prices go down. When they decrease, bond prices go up. the effect of a change in PRICE upon the quantity demanded of a product. In the THEORY OF DEMAND, the price effect can be subdivided into the SUBSTITUTION EFFECT and the INCOME EFFECT. In Fig. 147, a consumer has an initial BUDGET LINE XY (which shows the different combinations of the products A and B that he can buy given the relative prices of the two products). I1 and I2 are INDIFFERENCE CURVES (which show the alternative combinations of the two products, each of which yields him the same UTILITY or satisfaction). The point (L) where I2 is tangential to the budget line XY denotes the initial equilibrium position for the consumer, who maximizes his satisfaction by purchasing a combination of Od of product A and Oe of product B. Assume now that the price of product B increases so that the consumer is now unable to buy as much of product B as before. This new situation is reflected in an inward shift in the budget line from XY to XZ. The consumer will move to a new equilibrium position (point M) where I1 is tangential to the budget line XZ, purchasing Of of product A and Og of product B. The consumer's real income has been decreased by the rise in the price of product B. However, the movement from 1 to M and the reduction in the quantity purchased of B, from Oe to Og, is a result of the combination of an income and substitution effect. To isolate the substitution effect, it is necessary to increase the consumer's income just enough to compensate him for his loss in purchasing power; that is, the budget line is moved to the right parallel to itself until it becomes tangent to his original indifference curve I2 at point N (Combination N yields the same satisfaction as Combination L). But the consumer has cut his consumption of product B the price of which has risen relative to product A) and increased his consumption of product A. Hence the movement from 1 to N, or the decrease in quantity demanded of product B from Oe to Oh is the substitution effect. The income effect alone is determined by taking the compensating increase in income away from the consumer, that is, we revert back to budget line XZ, which cuts indifference curve I1 at point M, yielding the optimal combination of Of of product A and Og of product B. The movement from N to M is the income effect and reduces the quantity demanded of product B from Oh to Og . 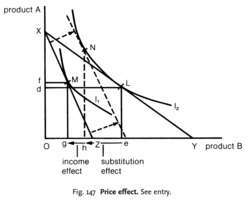 For NORMAL PRODUCTS, the income effect and the substitution effect reinforce each other so an increase in price will result in a decrease in quantity demanded. In the case of INFERIOR PRODUCTS, however, the income and substitution effects work in opposite directions, making it difficult to predict the effect of a change in price on quantity demanded. In extreme cases, where a product accounts for a large proportion of household budgets, the income effect of a price change may be so large as to swamp the substitution effect so that a decrease in price leads (perversely) to a decrease in quantity demanded. For example, in developing countries, where a high proportion of (small) household budgets is spent on foodstuffs such as rice, a fall in the price of rice can lead to a fall in quantity consumed as households’ real incomes are increased and they are able to buy more meat and fish in place of rice. See GIFFEN GOOD, CONSUMER EQUILIBRIUM. Over the next few months, the way inflation is calculated in France will also have an impact on the oil price effect. Packaging group Bunzl suffered the oil price effect as analysts at Deutsche Bank warned its costs would rise and it dropped 1. The elements of the equations are grouped by the type of effect, compensated own price effect, compensated cross price effect, and income effect. An analysis of the 121 day period surrounding the event revealed that the bankruptcy announcement decreased the value and increased the perceived riskiness of REITs; there was a negative stock price effect on the announcement day, and a positive change in systematic risk following the event. In Table IV, the price effect and the price cross effects are either negative or positive. The cross price effect of marijuana decriminalization with alcohol is insignificant in three of [TABULAR DATA FOR TABLE III OMITTED] four specifications and negative and significant in one. Then they seek to define the market narrowly, making it easy to find a price effect. Even after adopting these assumptions, the sign of the price effect is ambiguous since the quality effects on Hicksian recreation demands are ambiguous. Provided that the interest rate effect surmounts the price effect, currency devaluation will definitely have a negative impact on domestic output. When the sales were grouped by location of the line on the property, properties with edge locations showed no effect, while properties crossed by the line showed a small price effect of -2. Given the recent divergence in the WTI-Brent spread, going forward we will use the change in Brent to calculate a price effect because it is more closely tied to our international realisations," Jeanette Ourada, general manager of investors relations, told analysts on a conference call. A nontraditional store's entry into a new geographic market creates a direct price effect by offering a lower price option to consumers and an indirect price effect by causing traditional supermarkets to lower their prices because of the increased competition," it says.